Carlos Ghosn sees a global demand for 500,000 EVs a year from Renault and Nissan. Carlos Ghosn, CEO of both Nissan Motor Co. and Renault SA, has committed his companies unequivocally to electric vehicles. The result of that strategy is still unclear. Sales of the Nissan Leaf have been limited by a lack of availability. The factory's modest output can't meet demand. For Nissan as a whole, however, that hasn't been the case. Nissan's output rebounded faster than that of some other Japanese automakers, allowing combined U.S. Nissan and Infiniti sales through October to climb 15 percent, to 856,425, compared with a 10 percent gain for the industry as a whole. That gave Nissan a U.S. market share in the first 10 months of 2011 of 8.1 percent, up from 7.8 percent a year earlier. 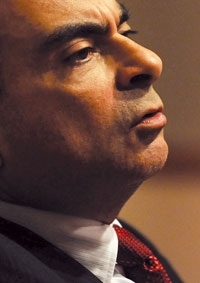 But Ghosn, 57, wants more: 10 percent. He met recently with Editor-in-Chief Keith E. Crain and Editor Jason Stein in New York to discuss his market-share goals, possible North American alliances and electric vehicles. Q: It seems companies and governments will have to subsidize electric vehicles for quite a while. What do you think? A: I agree. But when you switch 1 million combustion engine cars to 1 million electric cars, what are you switching? You're switching oil that you're buying from abroad. In France you're switching to nuclear power. Part of it oil. Marginally you're not adding oil because you know the United States is one of the largest deliverers of natural gas also. What got you onto that kick? Somebody had to convince you that this was a good thing for the ecology, for the company. Did you drive a Leaf? Yeah. I had one for six weeks. I loved it. My office is about six miles from my house. But it's too expensive -- $30,000 with the tax rebate. Let's not forget that all the cars now are made in Japan and that the yen is 25 percent, 30 percent up compared to when we made the plant. The car's going to be assembled and the battery is going to be assembled in the United States by the end of 2012, in Smyrna, [Tenn]. So you're going to eliminate the uncompetitive exchange rate. What will that do to the price? Knock it down $5,000 more? It's going to do nothing to the price, but it's going to help you move toward what you want, which is a sustainable model without support from the government. After all the first adopters and second-car buyers buy a Leaf, where are you going to get your growth from -- say, in the next three or five years? What do I have today? I have a lot of environmentalists, tech fans and very influential people. These three are the majority. When you have people asking you for cars and you can deliver only a small percentage of it, it's very difficult to have an opinion about what is the real demand. Our objective is 10 percent of the market in 2020. So you have different profiles that we have identified which present even more than 10 percent. Ten percent of which one? Of the market. Ten percent of the U.S. market, 10 percent of the Chinese market, 10 percent of the Japanese market. Not now. We're talking about 2020. By 2020, you're going to have many brands offering electric cars. I know that people are skeptical. They say where is it going to come from, who is going to buy these cars, and it's too expensive and it depends on government. Except that we are selling every single car we are producing, and when we see the profile of the people: 55 years, 55 percent male, $130,000 average income in the United States. I think the market is here. There is a demand for 500,000 a year globally between Renault and Nissan. After this, it is going to depend on a lot of factors. Competition. Oil price. How much do you think is going to be the oil price three or five years down the road? Would one of your motivations be to set Nissan and Renault apart from the herd, to have your company offer products that are demonstrably different from the other guy, to make people say, "I may not want a Nissan Leaf, but I want a Nissan." When you say you want to take the leadership and want innovative product, you are by definition setting yourself apart. We didn't do it for that, but are we looking to benefit from that? Yes. It makes sense. On top of that, 80 percent of the Leaf [sales] are conquests. You were courting General Motors a few years ago as a possible partner. Are there any other partnerships in North America that make sense today? As you know, since then we have a very strong cooperation with Daimler; a strategic partnership with a moderate change of shareholding, 3 percent. Going very well. What I was pursuing with GM was based on collaboration. Obviously you cannot have collaboration if one party does not want to collaborate. So we stopped. With Daimler, I think we have discovered something really very strong. Do you expect the overall market for cars to grow next year in America? Not so much, but I don't see a recession next year in the United States. Will Nissan sales grow next year? Yes. We're having a very significant growth at Nissan. In the last year, we've grown by 600,000 cars. We went from 3.6 million to 4.2 million. Globally. This year we are moving from 4.2 [million] to a minimum of 4.6 [million], so about 10 percent increase this year [despite] the Thai [floods] and the tsunami [in Japan]. We're up in the United States, we're up in China, we're up in Europe. We are up in Russia, we're up in India, we're up in the Middle East. I don't have the exact number, but the U.S. is going to be a big part of that. You've also taken advantage of the situation where you weren't as adversely affected by the tsunami and the earthquake. No, I was, but I reacted much more strongly. It's being on top of the situation, having processes, having teams working day and night, very good coordination, because we've been hard-hit. We had one plant which was 40 kilometers [25 miles] from the Fukushima plant. It's an engine plant, so it's not safe. No, we were not lucky. We were just as hit as anybody else if not more, but we reacted very strongly. You're going to have cars in the United States next year for Nissan with hybrid technology. How much will you spread that across your range of vehicles? We don't say, 'We need to have hybrids everywhere.' We just say, 'What are the requirements in this segment of the market? What are consumers looking for?' Then we deliver. In three or four years, say by 2015, what percent of your sales could be hybrid? I'm unable to give you from the top of my mind how many, but I don't think it's going to be very significant. It could be smaller than electric. Where are there gaps today in Nissan's portfolio in America? Frankly, we're covering practically the whole segment of the market. We have one of the largest product offerings in the market today. Small cars, sedan, sports car, luxury, 4x4, trucks, commercial vehicle. My concern is not so much do we have holes in our product offering. It is, do we have overlaps? Obviously we do, because every time you replace one car by another one, or two cars by one, that means you're filling some overlaps, and you come with a better concept. But this is normal product planning at work. I don't think we have a big hole in our product offering in the United States today. In your Nissan Power 88 plan, you talked about achieving 10 percent market share in the United States. When do you think you can get there? Within the midterm plan. The midterm plan goes to 2016. We are already at eight, which is great, so as fast as possible but I want it to be done well. I don't want them to go up and down. I want them to go steady, sustainable increase of market share, segment by segment, good quality. What's the key to growing that share? The most important element is to have enough cars with big volumes. Not multiplying the number of product we launch in the United States, but having a limited number of cars with very big volumes to sustain the brand. We have good prospects today. We have the Altima, which is a brand builder; we have the Versa, which is a brand builder; we have the Sentra, which is a brand builder. We have the Rogue, which is also a brand builder. I want cars, big volumes. A lot of cars [selling] small volumes -- that doesn't work anymore.